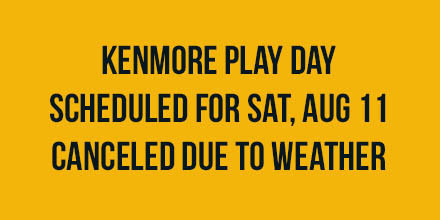 Kenmore Play Day, scheduled for Saturday, August 11th at Rhododendron Park (6910 NE 170th St) from 11am - 2pm has been canceled due to inclement weather. This outdoor event has many activities, booths and inflatables that will likely be impacted by the weather. Several vendors have just let us know they will be unable to attend tomorrow. Safety is the first priority and as such, the City of Kenmore has made the difficult decision to cancel the event. Event staff has contacted the remaining vendors, but if you are a vendor or were scheduled to participate in the event in some other capacity and have questions, contact Shelby Krogh or go to kenmorewa.gov/events.